Is it weird that when I think of ‘cooking’ with beer I think of cake? Ya, I’m weird, it’s cool. These looks so rich and juicy. Oh yes pls, I love this recipe. Have pinned for another day, thanks. Now following you too for more beer recipes. Ah, yum. I must make this soon. And by soon, I mean I should’ve eaten this, like, 5 minutes ago! Just found your blog and love it! I have a “cooking with beer” series on my blog and this is going on my list to try for the series. I love craft beer and think it’s an excellent ingredient! Gorgeous sliders. 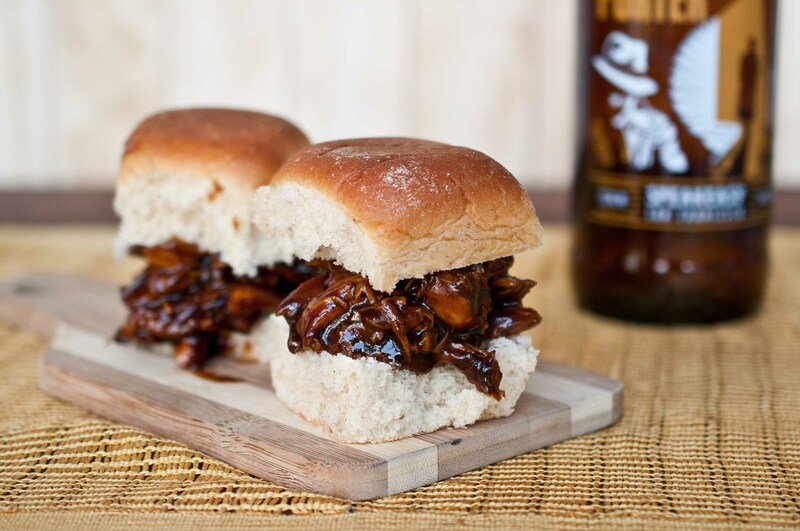 I love cooking with beer, and I’m game for any recipe that involves hoisin. Well done! Just made this last night for dinner and it was amazing!! 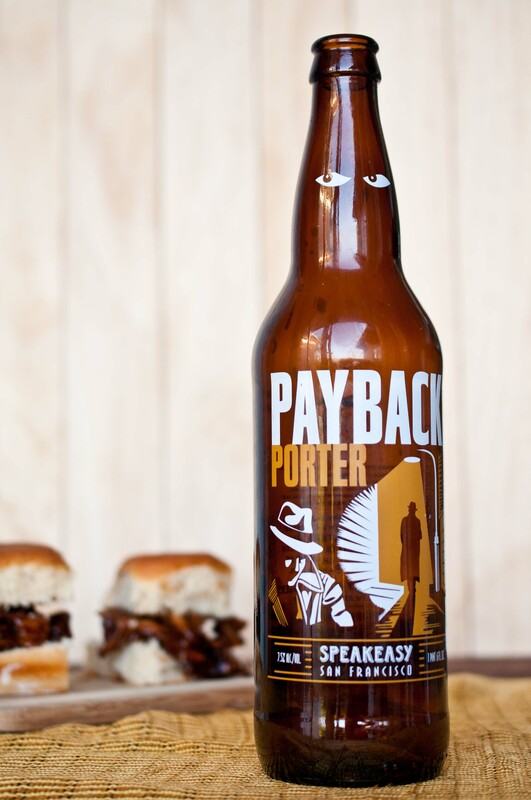 A must try for those who like BBQ. Simply mouthwatering. Must try these! Made this tasty little delight for dinner tonight. We love it! I used an Amber and added a touch of molasses to the sauce. The sauce does pull a great pork flavor from the chicken. I did add some chili flakes to my sandwich as I like some punchy heat. Served with a Carolina style coleslaw and called it a night. 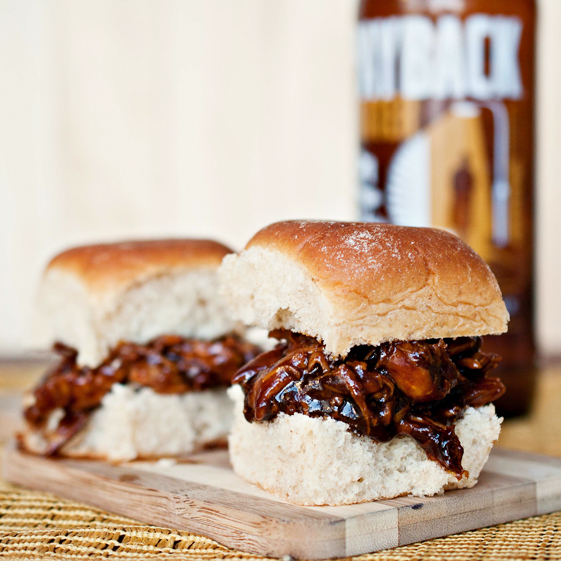 Thank you for my go-to BBQ recipe for Summer 2012! Excellent! Your modifications sound awesome and an amber is a great beer choice. Cheers! This has been in my pinterest “must try” food items for a few days now. Tried it with a hefeweizen made locally here in NC and it’s awesome! This is going in the recipe book FOR SURE! Excellent 🙂 that makes my day, thank you! Sweet mother of all that is holy, I can’t wait to try this! What would you recommend for a side dish? I served these with a warm potato salad made with sour cream, deli mustard and bacon. Maybe an asian coleslaw or grilled veggies? I made this tonight and it turned out wonderfully. I used a stout (Guinness – b/c the only beer I had in the fridge were this and Michelob Ultra) it gave a really rich, nice, slightly bitter bite to the chicken. It was very tasty – great recipe, thank you! My mother-in-law really liked it too, that’s who I was most worried about. I served it with an asian slaw, lime-agave fruit salad and chipotle baked beans. I actually don’t even own a slow cooker/crock pot so I have no idea! Maybe look for similar recipes and check what cooking time other people used? But let me know what time you use and how it turns out, I’d love to know! I made it in a slow cooker yesterday and it came out great. just put it in the crock pot with the beer and chicken broth. Also used boneless skin thighs because that is what I had in the freezer. Served with a yummy asian cole slaw. I made this tonight and it was outstanding. I used Magners hard cider in place of the beer (the Sierra Nevada I had in the house just didn’t sound right with hoisin sauce). I will definitely make it again! Just found your blog.. My brother brews his own beer and does it pretty well (grows his own hops, experiments with wild yeast)! We are a big food, and as of two years ago, craft beer family. I can’t wait to share this with everyone in my family so we can try these recipes using my brother’s brews! So great. Thanks so much! He grows his own hops? That is so impressive! So glad you like my blog! I’m going to the store to buy a beer, I don’t drink beer and am pretty sure this keystone is not what you had in mind (haha). I’ll post again after dinner. Looks delicious!! Is there a printer friendly version? I’m not seeing it if there is…. Trying these for a superbowl app today 🙂 They look like the perfect game starters! I made this with Kalibur (nonalcoholic version of Guinness) and it was delish!! I did add some tobasco to cut the sweet a bit though. I’ve been looking for a recipe to bring to my work’s potluck, and this looks perfect! I’ve only recently gotten into cooking, so I’m excited to try this out! The thing is that I haven’t cooked much yet, so I have a question – should I make some slaw to go on the sliders (as an option for my coworkers to put on)? Or do you think this is best plain, with no slaw? Thanks! I’ve served this before with a quick pickled slaw and another time with a spicy slaw that had jalapeños in it. Some people really like to have it with a slaw so it would probably work well to have it as an option. This recipe is truly amazing. It took my boyfriends love for me to a higher level, I promise. Made it several times now, with different porters. Havn’t found the one you are using, but I’ve found that Nøgne Ø’s porter (local brewery here in Norway) and actually one called Bully Porter is really good here. Yum. I bought your book after theese sliders, so much good! Wish I just could stay home and make food and eat. You have any suggestions for side dish here? I’ve tried jalapenos dip, coleslaw in different variations and of course homemade burgerbread or tortillas. I made a big triple batch of these for a party and they were delicious! The leftovers tasted just as good (if not better) the next day too :-). Made this for supper tonight. I am wondering if I did not use a beer with enough flavor. I cooked the sauce and found it to taste only of hoisin sauce. Pretty bland. I added about 1-2 tbsp of hot sauce and about 1/2 cup of ketchup and cooked for a bit longer. My family enjoyed it very much. I will try a different beer next time, but I know I can always add what I did this time around.